For other uses, see Redox (disambiguation). Sodium and fluorine bonding ionically to form sodium fluoride. Sodium loses its outer electron to give it a stable electron configuration, and this electron enters the fluorine atom exothermically. The oppositely charged ions are then attracted to each other. The sodium is oxidized, and the fluorine is reduced. Demonstration of the reaction between a strong oxidising and a reducing agent. 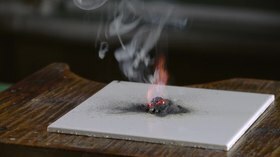 When a few drops of glycerol (mild reducing agent) are added to powdered potassium permanganate (strong oxidising agent), a violent redox reaction accompanied by self-ignition starts. Oxidation is the loss of electrons or an increase in oxidation state by a molecule, atom, or ion. Reduction is the gain of electrons or a decrease in oxidation state by a molecule, atom, or ion. As an example, during the combustion of wood, oxygen from the air is reduced, gaining electrons from carbon which is oxidized. Although oxidation reactions are commonly associated with the formation of oxides from oxygen molecules, oxygen is not necessarily included in such reactions, as other chemical species can serve the same function. The reaction can occur relatively slowly, as with the formation of rust, or more quickly, in the case of fire. There are simple redox processes, such as the oxidation of carbon to yield carbon dioxide (CO2) or the reduction of carbon by hydrogen to yield methane (CH4), and more complex processes such as the oxidation of glucose (C6H12O6) in the human body. "Redox" is a portmanteau of the words "reduction" and "oxidation". The word oxidation originally implied reaction with oxygen to form an oxide, since dioxygen (O2 (g)) was historically the first recognized oxidizing agent. Later, the term was expanded to encompass oxygen-like substances that accomplished parallel chemical reactions. Ultimately, the meaning was generalized to include all processes involving loss of electrons. The word reduction originally referred to the loss in weight upon heating a metallic ore such as a metal oxide to extract the metal. In other words, ore was "reduced" to metal. Antoine Lavoisier (1743–1794) showed that this loss of weight was due to the loss of oxygen as a gas. Later, scientists realized that the metal atom gains electrons in this process. The meaning of reduction then became generalized to include all processes involving a gain of electrons. Even though "reduction" seems counter-intuitive when speaking of the gain of electrons, it might help to think of reduction as the loss of oxygen, which was its historical meaning. Since electrons are negatively charged, it is also helpful to think of this as reduction in electrical charge. The electrochemist John Bockris has used the words electronation and deelectronation to describe reduction and oxidation processes respectively when they occur at electrodes. These words are analogous to protonation and deprotonation, but they have not been widely adopted by chemists worldwide. The term "hydrogenation" could be used instead of reduction, since hydrogen is the reducing agent in a large number of reactions, especially in organic chemistry and biochemistry. But, unlike oxidation, which has been generalized beyond its root element, hydrogenation has maintained its specific connection to reactions that add hydrogen to another substance (e.g., the hydrogenation of unsaturated fats into saturated fats, R−CH=CH−R + H2 → R−CH2−CH2−R). The word "redox" was first used in 1928. The processes of oxidation and reduction occur simultaneously and cannot happen independently of one another, similar to the acid–base reaction. The oxidation alone and the reduction alone are each called a half-reaction, because two half-reactions always occur together to form a whole reaction. When writing half-reactions, the gained or lost electrons are typically included explicitly in order that the half-reaction be balanced with respect to electric charge. Though sufficient for many purposes, these general descriptions are not precisely correct. Although oxidation and reduction properly refer to a change in oxidation state — the actual transfer of electrons may never occur. The oxidation state of an atom is the fictitious charge that an atom would have if all bonds between atoms of different elements were 100% ionic. Thus, oxidation is best defined as an increase in oxidation state, and reduction as a decrease in oxidation state. In practice, the transfer of electrons will always cause a change in oxidation state, but there are many reactions that are classed as "redox" even though no electron transfer occurs (such as those involving covalent bonds). The international pictogram for oxidizing chemicals. Substances that have the ability to oxidize other substances (cause them to lose electrons) are said to be oxidative or oxidizing and are known as oxidizing agents, oxidants, or oxidizers. That is, the oxidant (oxidizing agent) removes electrons from another substance, and is thus itself reduced. And, because it "accepts" electrons, the oxidizing agent is also called an electron acceptor. Oxygen is the quintessential oxidizer. 4), or else highly electronegative elements (O2, F2, Cl2, Br2) that can gain extra electrons by oxidizing another substance. Substances that have the ability to reduce other substances (cause them to gain electrons) are said to be reductive or reducing and are known as reducing agents, reductants, or reducers. The reductant (reducing agent) transfers electrons to another substance, and is thus itself oxidized. And, because it "donates" electrons, the reducing agent is also called an electron donor. Electron donors can also form charge transfer complexes with electron acceptors. Reductants in chemistry are very diverse. Electropositive elemental metals, such as lithium, sodium, magnesium, iron, zinc, and aluminium, are good reducing agents. These metals donate or give away electrons readily. Hydride transfer reagents, such as NaBH4 and LiAlH4, are widely used in organic chemistry, primarily in the reduction of carbonyl compounds to alcohols. Another method of reduction involves the use of hydrogen gas (H2) with a palladium, platinum, or nickel catalyst. These catalytic reductions are used primarily in the reduction of carbon-carbon double or triple bonds. ​1⁄2 H2 → H+ + e−. red, or potential when the half-reaction takes place at a cathode. The reduction potential is a measure of the tendency of the oxidizing agent to be reduced. Its value is zero for H+ + e− → ​1⁄2 H2 by definition, positive for oxidizing agents stronger than H+ (e.g., +2.866 V for F2) and negative for oxidizing agents that are weaker than H+ (e.g., −0.763 V for Zn2+). Analyzing each half-reaction in isolation can often make the overall chemical process clearer. Because there is no net change in charge during a redox reaction, the number of electrons in excess in the oxidation reaction must equal the number consumed by the reduction reaction (as shown above). Elements, even in molecular form, always have an oxidation state of zero. In the first half-reaction, hydrogen is oxidized from an oxidation state of zero to an oxidation state of +1. In the second half-reaction, fluorine is reduced from an oxidation state of zero to an oxidation state of −1. A redox reaction is the force behind an electrochemical cell like the Galvanic cell pictured. The battery is made out of a zinc electrode in a ZnSO4 solution connected with a wire and a porous disk to a copper electrode in a CuSO4 solution. In the above reaction, zinc metal displaces the copper(II) ion from copper sulfate solution and thus liberates free copper metal. The combustion of hydrocarbons, such as in an internal combustion engine, which produces water, carbon dioxide, some partially oxidized forms such as carbon monoxide, and heat energy. Complete oxidation of materials containing carbon produces carbon dioxide. In organic chemistry, the stepwise oxidation of a hydrocarbon by oxygen produces water and, successively, an alcohol, an aldehyde or a ketone, a carboxylic acid, and then a peroxide. Cathodic protection is a technique used to control the corrosion of a metal surface by making it the cathode of an electrochemical cell. A simple method of protection connects protected metal to a more easily corroded "sacrificial anode" to act as the anode. The sacrificial metal instead of the protected metal, then, corrodes. A common application of cathodic protection is in galvanized steel, in which a sacrificial coating of zinc on steel parts protects them from rust. Oxidation is used in a wide variety of industries such as in the production of cleaning products and oxidizing ammonia to produce nitric acid, which is used in most fertilizers. Redox reactions are the foundation of electrochemical cells, which can generate electrical energy or support electrosynthesis. Metal ores often contain metals in oxidized states such as oxides or sulfides, from which the pure metals are extracted by smelting at high temperature in the presence of a reducing agent. The process of electroplating uses redox reactions to coat objects with a thin layer of a material, as in chrome-plated automotive parts, silver plating cutlery, galvanization and gold-plated jewelry. Many important biological processes involve redox reactions. Biological energy is frequently stored and released by means of redox reactions. Photosynthesis involves the reduction of carbon dioxide into sugars and the oxidation of water into molecular oxygen. The reverse reaction, respiration, oxidizes sugars to produce carbon dioxide and water. As intermediate steps, the reduced carbon compounds are used to reduce nicotinamide adenine dinucleotide (NAD+) to NADH, which then contributes to the creation of a proton gradient, which drives the synthesis of adenosine triphosphate (ATP) and is maintained by the reduction of oxygen. In animal cells, mitochondria perform similar functions. See the Membrane potential article. Free radical reactions are redox reactions that occur as a part of homeostasis and killing microorganisms, where an electron detaches from a molecule and then reattaches almost instantaneously. Free radicals are a part of redox molecules and can become harmful to the human body if they do not reattach to the redox molecule or an antioxidant. Unsatisfied free radicals can spur the mutation of cells they encounter and are, thus, causes of cancer. The term redox state is often used to describe the balance of GSH/GSSG, NAD+/NADH and NADP+/NADPH in a biological system such as a cell or organ. The redox state is reflected in the balance of several sets of metabolites (e.g., lactate and pyruvate, beta-hydroxybutyrate, and acetoacetate), whose interconversion is dependent on these ratios. An abnormal redox state can develop in a variety of deleterious situations, such as hypoxia, shock, and sepsis. Redox mechanism also control some cellular processes. Redox proteins and their genes must be co-located for redox regulation according to the CoRR hypothesis for the function of DNA in mitochondria and chloroplasts. A wide variety of aromatic compounds are enzymatically reduced to form free radicals that contain one more electron than their parent compounds. In general, the electron donor is any of a wide variety of flavoenzymes and their coenzymes. Once formed, these anion free radicals reduce molecular oxygen to superoxide, and regenerate the unchanged parent compound. The net reaction is the oxidation of the flavoenzyme's coenzymes and the reduction of molecular oxygen to form superoxide. This catalytic behavior has been described as a futile cycle or redox cycling. Mi Vida uranium mine, near Moab, Utah. The alternating red and white/green bands of sandstone correspond to oxidized and reduced conditions in groundwater redox chemistry. In geology, redox is important to both the formation of minerals and the mobilization of minerals, and is also important in some depositional environments. In general, the redox state of most rocks can be seen in the color of the rock. The rock forms in oxidizing conditions, giving it a red color. It is then "bleached" to a green—or sometimes white—form when a reducing fluid passes through the rock. The reduced fluid can also carry uranium-bearing minerals. Famous examples of redox conditions affecting geological processes include uranium deposits and Moqui marbles. Describing the overall electrochemical reaction for a redox process requires a balancing of the component half-reactions for oxidation and reduction. In general, for reactions in aqueous solution, this involves adding H+, OH−, H2O, and electrons to compensate for the oxidation changes. In acidic media, H+ ions and water are added to half-reactions to balance the overall reaction. In basic media, OH− ions and water are added to half reactions to balance the overall reaction. "OIL RIG" — oxidation is loss of electrons, reduction is gain of electrons. "LEO the lion says GER" — loss of electrons is oxidation, gain of electrons is reduction. "LEORA says GEROA" — loss of electrons is oxidation (reducing agent), gain of electrons is reduction (oxidizing agent). "RED CAT" and "AN OX", or "AnOx RedCat" ("an ox-red cat") — reduction occurs at the cathode and the anode is for oxidation. "RED CAT gains what AN OX loses" – reduction at the cathode gains (electrons) what anode oxidation loses (electrons). ^ "redox – definition of redox in English | Oxford Dictionaries". Oxford Dictionaries | English. Archived from the original on 2017-10-01. Retrieved 2017-05-15. ^ "Redox Reactions". wiley.com. Archived from the original on 2012-05-30. Retrieved 2012-05-09. ^ Bockris, John O'M. ; Reddy, Amulya K. N. (1970). Modern Electrochemistry. Plenum Press. pp. 352–3. ^ Harper, Douglas. "redox". Online Etymology Dictionary. ^ Hudlický, Miloš (1996). Reductions in Organic Chemistry. Washington, D.C.: American Chemical Society. p. 429. ISBN 978-0-8412-3344-7. ^ Hudlický, Miloš (1990). Oxidations in Organic Chemistry. Washington, D.C.: American Chemical Society. p. 456. ISBN 978-0-8412-1780-5. ^ Electrode potential values from: Petrucci, Ralph H.; Harwood, William S.; Herring, F. Geoffrey (2002). General chemistry: principles and modern applications (8th ed.). Upper Saddle River, N.J: Prentice Hall. p. 832. ISBN 978-0-13-014329-7. LCCN 2001032331. OCLC 46872308. ^ a b c Robertson, William (2010). More Chemistry Basics. National Science Teachers Association. p. 82. ISBN 978-1-936137-74-9. ^ a b c Phillips, John; Strozak, Victor; Wistrom, Cheryl (2000). Chemistry: Concepts and Applications. Glencoe McGraw-Hill. p. 558. ISBN 978-0-02-828210-7. ^ a b c d Rodgers, Glen (2012). Descriptive Inorganic, Coordination, and Solid-State Chemistry. Brooks/Cole, Cengage Learning. p. 330. ISBN 978-0-8400-6846-0. ^ a b c Zumdahl, Steven; Zumdahl, Susan (2009). Chemistry. Houghton Mifflin. p. 160. ISBN 978-0-547-05405-6. Schüring, J.; Schulz, H. D.; Fischer, W. R.; Böttcher, J.; Duijnisveld, W. H., eds. (1999). Redox: Fundamentals, Processes and Applications. Heidelberg: Springer-Verlag. p. 246. hdl:10013/epic.31694.d001. ISBN 978-3-540-66528-1. Tratnyek, Paul G.; Grundl, Timothy J.; Haderlein, Stefan B., eds. (2011). Aquatic Redox Chemistry. ACS Symposium Series. 1071. doi:10.1021/bk-2011-1071. ISBN 978-0-8412-2652-4. Wikimedia Commons has media related to Redox reactions. Chemical Equation Balancer – An open source chemical equation balancer that handles redox reactions.